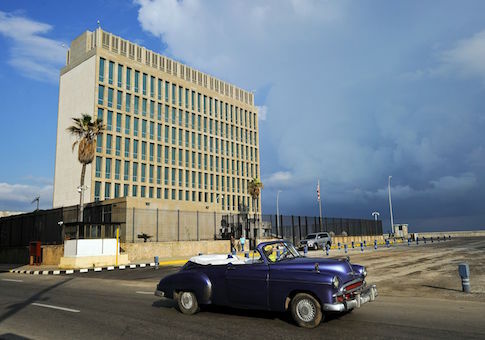 Cuba is again in the middle of what could be another confrontation between the United States and Russia, after Moscow was identified in a news report as the main suspect in the string of mysterious attacks against U.S. embassy personnel and relatives in Havana. An NBC report quoting unidentified U.S. officials said federal agencies investigating the incidents have intercepted intelligence communications that point to Russian responsibility for the attacks, although the evidence is not conclusive enough to formally accuse Moscow. But if a Russian role is confirmed, “that would be unprecedented. That’s never happened,” said Frank Mora, who served as deputy secretary of defense for Latin America and now heads the Kimberly Green Latin American and Caribbean Center at Florida International University. “Russia has meddled in the U.S. elections and has been behind the attacks on former Russian spies in England, but to provoke serious injuries to U.S. officials, that is much more complicated and the United States has to react in some way,” he added. The NBC report said the U.S. military is working to replicate the weapon or weapons used to injure 26 employees of the State Department, the CIA and other federal agencies as well as relatives who were based in Havana. The victims suffered symptoms such as loss of hearing, cognitive problems and some experienced brain damage. A team of doctors that investigated the incidents at the request of the U.S. government has said it’s possible the attackers used a “neuro-weapon” of directed energy that could damage the brain by causing a “cavitation” effect with ultrasonic, electromagnetic or microwaves. The U.S. Air Force research program on directed energy is participating in the investigation. Article continues here: Russians in Cuba? If it happened on Cuban terrritory, Cuba is responsible. There will be no confrontation between the U.S. and Cuba as long as Trump continues asleep at the wheel and following Obama’s Cuba policy to the letter for the last two years. Chris — You can bet this administration will do nothing. Don’t forget earlier this year that Russian troops from the Wagner organization, a mercenary outfit linked to Yevgeniy Prigozhin, a Russian oligarch and one of Putin’s closest personal friends, (who was indicted by special counsel Robert S. Mueller III for an alleged role in “information warfare” ahead of the 2016 U.S. presidential election) attacked U.S. Special Forces in Syria. Intelligence intercepts indicated an unnamed senior Russian official signed off on the attack. No U.S. troops were killed and, apparently, according to Mike Pompeo in his testimony before the Senate Foreign Relations Committee, while he was still CIA Director, “several hundred Russians” were killed in the U.S. response. The point being that this was an act of war, just like these sonic attacks. Trump himself never even mentioned the Russian attack in Syria, let alone did anything about it. He certainly won’t do anything now, either. Was Cuba aware of these attacks? From open source information it’s hard to say. It’s certainly possible but we cannot be certain at this stage. Let’s hope more information is released going forward. The sonic attack situation needs to be resolve,how? helping those people that are fighting the regimes supported by Russia,Nicaragua, Cuba and Venezuela as well as the Ukraine are Russia areas of interests,let’s begin by supporting those nations to free themselves from Socialism and in the case of Ukraine help the Ukrainian Army fight the Russian mercenaries and the Ukrainian separatists supported by Moscow. We need determination and audacity!!! The Cuban regime is also at fault for been a Moscow proxy, Russia and Cuba are responsible for those attacks and they should pay. We should retaliate against the Russian interests in latin America, against Venezuela, Cuba and Nicaragua. We should also increase our help to Ukraine. Castro has used the immigration waves to his favor. His regime can not supply the needs of its citizens, the regime every time there is civil unrest inside the island, they create an exodus of people fleeing as a way to relieve their social tensions and civil unrest. Let’s control our immigration to deny the Castro regime their escape valve to their economic and social problems by doing that, Cubans will be forced to fight to free themselves from the regime.